Do you want to add a new Ceiling fan to your room? Does your Ceiling fan need replacement? We are the experts that can help you. The Electrician Squad believes that you can keep your room cool and beautiful with the right Ceiling fan. They are a great addition to your home because it is cheaper to use. Just like it is not advisable to install or repair your Air Conditioning system by yourself, we believe you are best served when we install your Ceiling fan. 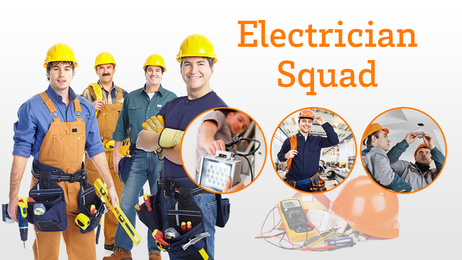 The nature of handling electrical appliances is a delicate field so it is safer to work with the experts. It can be dangerous to get shocked and the consequence can be far-reaching. This is why it is in your best interest to call on The Electrician squad to do your Ceiling Fan Installation, replacement and repair today. It is our desire to ensure that the Ceiling fan functions properly and looks good. The safety of you and your loved ones is something that we would not sacrifice for anything. In order for you to get a timely job that is done in the best light, do contact us today. We know how to deliver with precision. There is nothing that can take away the fact that you deserve nothing but the best. We give you the best service. You can get a new look in your space and save utility cost by installing a new Ceiling fan. Our team is experienced and we can give you great service at all times. There is a great relief that comes to the heart of a client when they know they have made a wise move. Working with us is not only the wise thing to do; it gives you the experience that would WOW you. Do call on us for your Ceiling Fan service and we would be prompt to meet your needs.